This event, which takes place at the spectacular Terrace in the Sky restaurant, features performances by Robert* and Nicola Royston (Dance Manhattan - West Coast Swing), Simone Assboeck** and Ernesto Alonso Palma (Stepping Out Studios - Latin), and two special guest dancers (Jennifer Muller | The Works*** - Modern Dance). There will be a free dance lesson. After the show, you can dance the night away to Swing and Latin music with DJs John Lindo and Wes Carrajat****. You Should Be Dancing dance studio will be providing dance hosts, so even if you have never danced before, there will be someone there to help you look good on the dance floor. Tickets include a one hour premium open bar with unlimited passed hors d'oeuvres, with a cash bar and ala cart tapas before and afterwards. Only $35 per person if paid in advance or $40 per person at the door. Doors open at 7 pm. Performances start at 7:30 pm. (There may be a second show at 8:15 pm.) Dance lesson and general dancing at 8:30 pm to Midnight. Open bar from 9 pm to 10 pm. No dress code, but this is a classy venue, so please dress to impress. Where else can you find the best of Performance Dance and Social Dance on the same stage? Come be inspired! Dance Lesson Preferred SwingSalsaBoth Swing and SalsaI don't really need a beginner lesson. If the show is presented twice, I would prefer to attend the 7:30 PM show8:15 PM showEither show works for me. Note: when you complete your purchase, you will be given an option to suggest what style(s) of music you would prefer to dance to. (The field may say "Include a message on my card" if you have also ordered flowers.) Your name will be on a list of pre-paid ticket holders at the door. No tickets will be mailed. If there is a second show, ticket holders will be emailed with the details. You can buy flowers for any or all of the performers from Matles Florist in $10 increments. Matles Florist and ExploreDance.com will deliver a beautiful bouquet of flowers to the show with a card with your name to be given to the performers at the curtain call. There are no delivery charges. Matles Florist has consistently made my grandmother happy when I send her flowers, and if they can make my grandmother happy, they can make anyone happy. It has never been easier to show your appreciation of a great performer. Separate or Shared Bouquet? Create a bouquet just from me. ($20 minimum)Combine my flowers with flowers purchased by others, but provide a separate card. 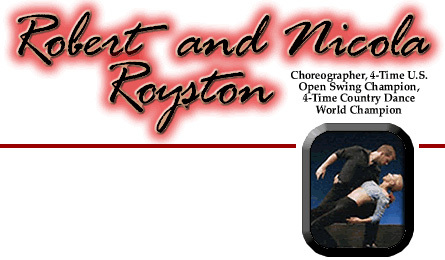 * Robert Royston is a Four-time US Open Swing Champion! ** Simone Assboeck is a German State Dance Champion! *** Jennifer Muller | The Works recently completed their 30th Anniversary Season at the Joyce Theatre, New York's premier theatre for dance! Founded in 1974 by Artistic Director Jennifer Muller, The Works has achieved a dynamic global presence. The company has toured 37 countries on 4 continents and 30 states in the USA and self-produced 20 NYC Seasons at the Joyce, City Center, New Victory and Roundabout Theaters and the Kaye Playhouse. The Works has premiered over 90 pieces, worked with a wide variety of artistic collaborators such as Yoko Ono, Keith Haring and Keith Jarrett and performed in such venues as The Kennedy Center, Jacob's Pillow, The United Nations and The New York Botanical Garden. Internationally, the company has traveled from Montreal to Buenos Aires, Moscow to Hong Kong. Ms. Muller's choreography has been commissioned by 23 international repertory companies and her work for theater and opera includes such venues as The Public Theater, Second Stage, New York Stage and Film and the Metropolitan Opera. JMTW will be presenting two duets! The Works wishes to thank Jan Hartley and Izquierdo Studio for its assistance on this project. The creation of Island was made possible by The Worksâ€°Â¥Ã» New Choreography Fund.